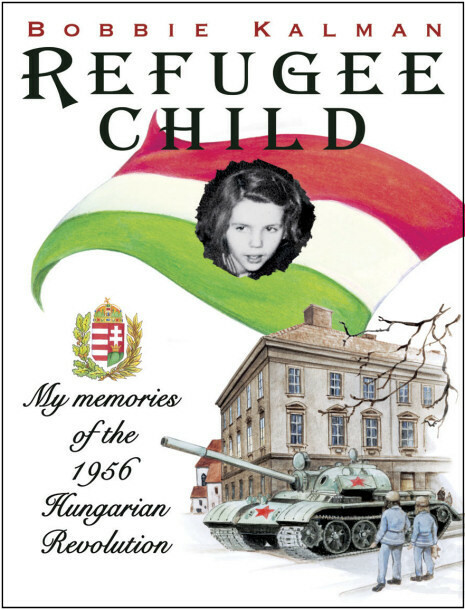 Book Highlight: Bobbie Kalman, "Refugee Child"
"Refugee Child" is the compelling story of children’s author Bobbie Kalman’s experiences as a young girl during the Hungarian Revolution in 1956. A touching roller coaster ride of emotions, Kalman writes her story from the perspective of a nine-year-old. She relives both her frightening experiences as well as some warm, and even funny, memories of her family and their flight to freedom. The book begins in Bobbie’s home town of Mosonmagyaróvár in Hungary where a peaceful protest against the Communist government is met with violence by the secret police. On the way home from school, a young Bobbie sees truckloads of wounded and lifeless bodies being brought to the hospital. At home she finds her family in panic and confusion trying to account for all of their family members. While all are found safe, they are shaken to realize that one of her aunts who had attended the rally had narrowly missed being one of those wounded. Bobbie did not fully understand why these events were happening but did understand the significance of the situation. In the days after the massacre in Mosonmagyaróvár in which over 100 people were killed and more than 200 wounded, the Soviet-controlled government sent infantry into the cities. Bobbie was shocked one morning to find a Russian tank parked in front of her home! Her home town, which is close to the Austrian border, suddenly became a way station for hundreds of journalists from the West and thousands of refugees fleeing to Austria. Her father, who always listened to Radio Free Europe, was excited to be able to communicate freely to so many people from the West. But Bobbie’s father had to make a momentous decision—Should he take his family and flee Hungary or stay and perhaps face arrest himself for helping others leave? He decided the family had to escape. Their first daring attempt by car was unsuccessful. They were easily caught by Russian soldiers. Bobbie played cards with the soldiers while waiting for her parents to be questioned. Although she had been living in fear for herself and her family’s safety for some time, she observed these young Russian men and wondered why she should be afraid of them. To her young mind, they seemed no different than any young Hungarian and this idea helped her deal with her fears. After being warned and let go by the soldiers, the family tried to escape again—this time on foot under the cover of darkness. After exhausting hours of walking through mud and snow and diving to the ground to avoid searchlights and barking dogs, the family tearfully and joyfully crossed the border into the welcoming arms of Austria. The Kalmans were now refugees with nothing but the few treasured possessions they were able to carry in their suitcases. But Bobbie had also brought her determined spirit and lively imagination. She viewed their move as an adventure. While in Vienna, she and her sister lived with a host family and their daughter whom they came to feel as close to as their own family. It seemed to Bobbie that all of Austria wanted to do something for the Hungarian refugees. They were greeted by a Bishop in Vienna, treated to dinners, taken on tours of Schönbrunn Castle and to an amusement park. The girls contentedly lived with their host family and even celebrated Christmas with them while their parents had the difficult job of competing with other refugees for visas to other countries and planning their future. After several weeks their time in Austria finally came to an end. After missing their first boat while searching for a missing relative, the family finally got passage to North America. Much to the surprise and delight of the refugees, the miserable boat they were expecting turned out to be a very grand cruise ship! After years of turmoil and struggle, Bobbie dreamed of turning her life into the fairy tale that she always knew it could be, and succeeded in doing so by becoming a successful children’s author. "1956 saw the first tear in the Iron Curtain. A people rose up against impossible odds and fought for freedom only to be brutally crushed by the Soviet military machine. 200,000 would flee across the minefields to freedom. What must this have been like for a 9-year-old girl and the parents that tried to protect her? "The Soviets occupied our country and wanted Hungarians to forget who we were." But Bobbie's own memories make sure we do not forget. A bittersweet tale of innocence, fascination, fear, courage, compassion, and re-awakening, "Refugee Child" is filled with descriptive illustrations and gives us a unique glimpse of this historic time from the perspective of a wide-eyed young girl. This is a must read for children and grown ups alike. We must never forget." - Bryan Dawson-Szilagyi, Executive Committee Chairman, American Hungarian Federation. Bobbie Kalman, an AHF Kovats Circle Member, is co-founder of Crabtree Publishing Company and one of the most prolific authors of children's books. 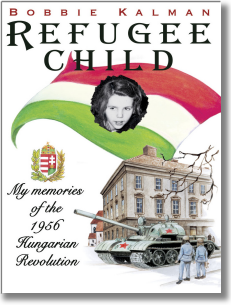 Her recently completed a book is targeted at older children and chronicles her experiences as a 9-year-old in the Hungarian Revolution of 1956, entitled "Refugee Child." AHF is proud to endorse this book. Bobbie is the author and publisher of several hundred children's books. She has created many of Crabtree's most popular series, including Historic Communities, Lands, Peoples, and Cultures, Kid Power, Native Nations of North America, Dolphin Worlds, Life Cycles, Food Chains, and many more. Bobbie's books are extremely successful in schools and public libraries because she writes them with specific curriculum needs in mind. She works with a team of creative writers who thoroughly research each subject. Bobbie has taught at both the elementary and secondary levels and has traveled extensively. Sign up for the AHF mailing list. Your information is not shared! DISCLAIMER: The American Hungarian Federation does not necessarily endorse the content or opinions expressed by its individual members and/or member organizations..